At some point, many bloggers decide that they want to monetize their blogs. They’re ready to take that leap and make an income. Unfortunately, some people take that leap before they are ready or before their blog is ready. 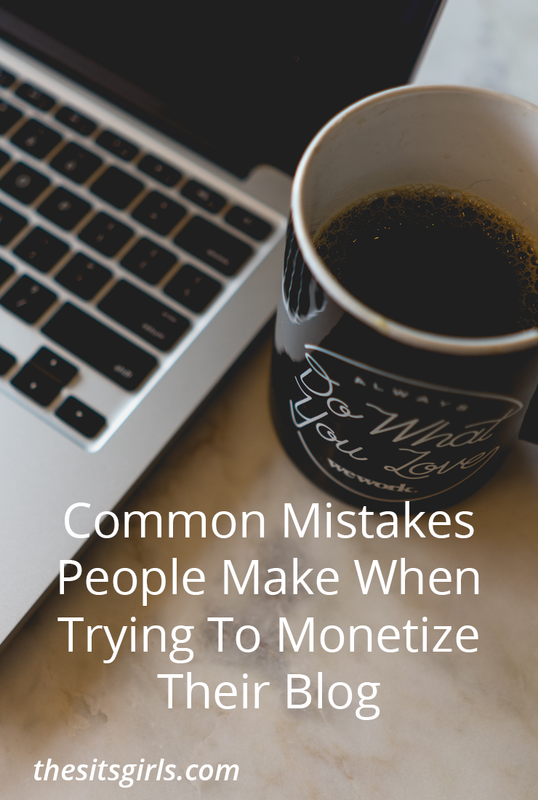 So today I want to cover some mistakes people make when trying to monetize blogs. If you can relate to any of these, don’t fret. It just means you’d been there, done that, and learned from it. In fact, I’ve done some of these myself, but I learned from the mistakes and am now able to focus on the things that matter and help me bring in a full-time income. I know that monetizing sounds like a good idea, but first you need to make sure that you have some sort of audience. You can’t expect to make money if no one reads your blog. But here’s the catch-22: size doesn’t matter. If you have 100 followers who constantly engage with you and are interested in you, then you could do well with some monetization techniques. If you have 1,000’s of followers and get little engagement, your chances are very slim. You need to create a circle of individuals who stick with you because they like you and what you create. Get people interested in you and get them to engage. A simple step that you can take to get them to engage with you is to ask your readers a question. Whether it’s a call to action question at the end of your posts or a question via your social media, just ask. Also, when it comes to your audience, know who they are and what they want. You need to find out who your audience is. Do that by checking out your Google Analytics. Also, you can do a survey or simply ask them what they’d like to see from you. Once you know who your audience is, you’ll know what products will most likely work best on your site. If your plan is to make a full time income from your blog, chances are is going to be a slow process if you plan on using ads and sponsored posts only. When it comes to ads, if you don’t have tons of traffic, you’ll mostly likely make pennies a day…literally. Trust me, I’ve been there. Also, don’t sit around waiting to be selected for sponsored posts. You can hustle and pitch brands to work with, but honestly if you have too many sponsored posts on your site within a short period of time, it can look a little spammy to your readers. Some companies don’t want to partner up with someone who constantly has sponsored posts. So what can you do besides ads and sponsored posts? You can try affiliate links or creating your own product: an e-book, a service or a printable. By creating your own product, you’ll be promoting your own stuff rather than spending hours promoting someone else’s. When you get caught up in creating a product or service sometimes people forget about their content. Don’t forget about it. It’s what brings in visitors to your blog. If you feel yourself going astray from posting content, try using an editorial calendar to keep yourself on track. Don’t give up. Don’t quit before you see results. You won’t see instant results when you monetize blogs. That doesn’t mean you have to wait years before you make a full-time income. But, you do need to find the strategies that will work for you. When something works, stick with it. Don’t change things up simply because another blogger is doing something a different way and it working for them. That’s just it. It works for THEM. That’s the method they found for them. You need to find your method. Focus and you might be surprised how quickly things fall into place. Are you guilty of any of these mistakes? No worries, I am, too. What are some mistakes that you think bloggers make when they try to monetize blogs? This is really helpful! Thank you. Being able to discipline myself and push through with my deadlines is something I need to improve on. Great article, ired this content before applying for Adsense for my blog and as expected I got it on the first try. Thank you. I want to monetize my website with adsense. My website has more than 80+ posts. Is it the right time to apply for adsense or not? When you think you have good quality content on your site you can monetize your website. But onlydo it when your contect is educative for the readers. Dont blog for the money.